A happy, working wife, already birth mother of two healthy young children -- a boy and a girl -- doubled the size of her family by adopting four Ethiopian children. Why? Natalie then takes the reader on her family's adventure to Ethiopia to legally adopt the three siblings God has chosen to add to their family. With the skill of a detective novelist, she reveals their discovery of a fourth sibling, their critical decision not to leave this child behind, and their harrowing quest to find, woo and legally adopt her, too. Similar to the laugh-out-loud humor of books on blended step-families, Natalie shares the bedroom, bathroom and kitchen scenes of this adoptive family's huge adjustments. She brilliantly captures each child's and each parent's perspective and, in doing so, reveals God in their midst. NATALIE GWYN is a working wife and mother of six who lives in northern California. To keep from hiding in her closet, she writes what has become a very popular blog. "OKAYEST MOM is outstanding. It is an honest, tears-and-laughter filled account of God's love weaving family members from two continents together when they have the willingness and courage to live by faith. It made me laugh and cry. Well done!" "Parenting can be a gigantic mess, and most of us feel like failures at it, at least once in a while. Try dropping four kids to your family, from another continent, with a kind of brokenness that makes you want to weep. 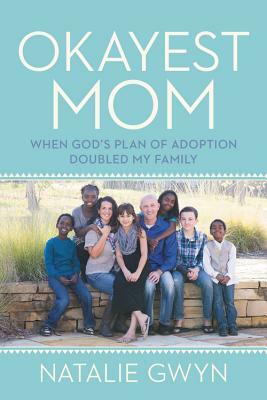 In WORLD'S OKAYEST MOM, Natalie Gwyn tells the heart-warming, crazy-making, stress-inducing, laugh-out-loud-funny story of a typical family jolted by a four-sibling, international adoption. Along the way, she bares her soul, as pain from her own broken childhood makes her more like her adopted kids than she realized. How will this family of four-turned-eight navigate these epic changes? New noise levels. New messes. New toilets, language, meltdowns, culture shock, school, foods, beds... and new love. Perhaps God's grace will show up in unexpected ways. "Natalie's journey will touch and inspire you. As an adoptive mother I hear the label often, but it's not okayest, it is real. Are you their 'real mom?' This book will make those words catch in your throat. This is the stuff that turns a woman into a real mom." "A heartfelt, encouraging & power packed book. Natalie's book will give clarity to so many people and encourage them to think about family in a whole new way."